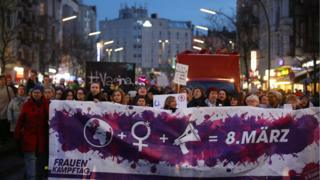 International Women's Day is to some extent a German idea, and this year the country's capital city is marking it as a public holiday for the first time. Berlin is a city state within Germany, and its local Senate decided to make 8 March a day off work in a vote at the end of January, German radio reported. Berlin is the only state in the country to recognise Frauentag (Women's Day) as a public holiday, but older Berliners may remember that eastern districts used to hold official festivities every year until 1990. That is because the Soviet satellite state of East Germany included Women's Day in its long list of sanctioned celebrations, which meant big parades in East Berlin - the Communist country's capital. German socialist activists Luise Zietz and Clara Zetkin first proposed marking an International Women's Day at the Conference of Socialist Women in Copenhagen in 1910, but post-1945 West Germany distanced itself from the 8 March date to avoid any associations with the rival government in East Berlin. West Germans began to mark International Women's Day more widely in the 1970s, after it was officially adopted by the United Nations, and this year Berlin expects to see a mass march to Clara Zetkin's memorial on the central Alexanderplatz Square. This will be followed by a less sedate "global scream" - a 90-second mass howl of "rage without restraint" at continuing inequality - sponsored by activists in the once working-class and now bohemian Kreuzberg district. The organisers want protesters to highlight how old-age poverty and the burden of unpaid work effect women more than men, along with the long-standing issue of Germany's gender wage-gap of 21%, the Berlin Brandenburg public broadcaster reports. Theresa Hartmann of the Frauen*Streik (Women's Strike) network wants women to sit out on chairs on the street from 1700 to midnight to protest against unpaid labour, including housework, and to express solidarity with hospital staff who are unable to take the day off. Germany's Family and Women's Minister Franziska Giffey tried to reunite the themes of female empowerment and the dignity of labour by donning orange overalls and working a shift with refuse collectors in the Berlin suburb of Wilmersdorf. "A great deal has been achieved in terms of gender equality in recent years," she said, "but we still have a lot to do." The minister called for more women "in leadership positions in every profession", and pledged to "value the caring professions and do more to combat domestic violence, especially against women". Police figures show that a woman dies of domestic violence in Germany every three days - a point not lost on the local Alliance of International Feminists. "Berlin is marking Women's Day as a celebration. That implies that we've already achieved a lot, but that's just not true" one activist told Germany's Deutsche Welle foreign broadcaster. She says the Alliance also intends to highlight the treatment of women in jail and asylum centres, campaigning under the slogan 'United we get what we want'. The Berlin Senate, having declared the public holiday, seems less inclined to join in the celebrations. Mayor Michael Müller and his cabinet have no official events planned for today, Deutsche Welle says - which may simply mean they are taking the day off work too.